Haddington is on the A1 Edinburgh to Berwick on Tweed road, about 20 miles from Edinburgh. The exact address is on the Contact Us page and on the Google Map page. 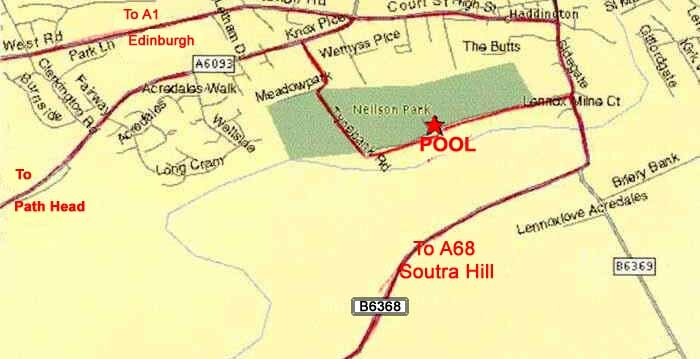 If you are coming from Edinburgh and the North, you will have two options of how to reach the pool. You can turn right at the Station Road lights or go straight on through the town centre. The Google Map is HERE and you can use it to plan your route. If you don't know how to work google maps, please look at the tour pages on Google. If coming by bus, we cannot provide any advice on which bus to get as we simply don't know the details or have the time to help you plan your route. Please visit the TravelineScotland website for a public transport route planner. It will take between about 35 minutes and an hour on a bus from Edinburgh, depending on which one you get.